Knee pain is a condition that affects many clients attending our clinic here in Limerick. Below are a number of articles on some different conditions that can cause knee pain. Why it happens, what exactly goes wrong and what you can do about it. In this article we take look at knee pain that appears to have come on without any obvious injury to the knee joint. This is quite common, especially as you get older. This type of condition responds really well to physical therapy. To read our article on common knee pain, simply click on the link at the end of this sentence – Common Knee Pain. In this article we discuss anterior cruciate ligament injuries. These are reasonably common amongst competitive sport’s people. It is a serious injury and results in a long lay off. It usually results in knee instability, which requires surgery for many sport’s people. To read our article on common back pain, simply click on the link at the end of this sentence – Torn Anterior Cruciate Ligament (ACL Tear). 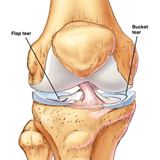 In this piece we examine cartilage (or meniscus) tears of the knee. Again, this injury is generally in the domain of sports people. This can be a serious injury, depending on its severity. If you have suffered a bad cartilage tear, then you may be unable to straighten your knee. To read our article on meniscus tears, simply click on the link at the end of this sentence – Cartilage Tear (Torn Meniscus). In this article, we look at patella (knee cap) fractures. This injury is more common in older people. To see our article on patella fractures, click on the link at the end of this sentence – Fractured Patella (Broken Kneecap).